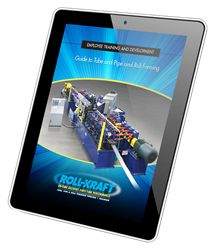 The e-book is free and can be downloaded at http://www.roll-kraft.com/performance-services/roll-kraft-resources/guide-to-tube-and-pipe-and-roll-forming. In addition to the new e-book, Roll-Kraft conducts regional training seminars and events periodically throughout the year. The company also offers personalized tube and pipe training and roll forming training programs on location at the customer’s facility. Conducting a training program on-site can prove to be highly beneficial, since it allows the instructors to focus on the customer’s mills, tooling, and staff, and provides an excellent opportunity for interaction and review of everyday issues and experiences. Visit Roll-Kraft’s website for more educational tube and pipe and roll forming articles. Roll-Kraft has its headquarters in Mentor, Ohio, and maintains other facilities in Frankfort, Illinois (Roll-Kraft Northern), Ontario, Canada (Roll-Kraft Ltd.), and Houston, Texas (Roll-Kraft Texas). Calls to the company‘s main line, (888) 953-9400 or (440) 205-3100, are greeted by a live operator who can assist callers in quickly reaching a technician, engineer, or sales staff, who can provide immediate assistance. The company’s fax number is (440) 205-3110. Learn more about Roll-Kraft by visiting roll-kraft.com. For easy and immediate contact with Roll-Kraft that transcends time zones and working hours, the website features an easy-to-use contact form.